The Government has achieved significant mile stones in the reforms of PDS by making it more transparent and leak proof during last 19 months. Number of States providing Rs 2/kg wheat and Rs3/kg rice has increased to 25 from 11 during last year and it is likely to be implemented in all the states by 1st April. This was stated by Shri Ram Vilas Paswan, Minister of Consumer Affairs, Food and Public Distribution while briefing the media about programmes, policies and future road map of his Ministries here today. Shri Paswan said that digitisation of ration cards is one of the important components for making PDS leak proof, 97% cards across the country have been digitised, and soon 100 % will be digitised. All the 36 States/UTs have online system for redressal of PDS grievances now. Direct Cash Transfer of food subsidy to the beneficiaries started in Chandigarh and Puducherry in September this year. The Minister said that based on the recommendations of High Level Committee on restructuring of FCI, procurement policy for paddy modified to ensure reach of MSP operations to more farmers. As a result huge paddy procurement has been made during Kharif season. The Government also provided relief to the farmers during the year by relaxing procurement norms for their crops affected with the unprecedented rains and hailstorms. 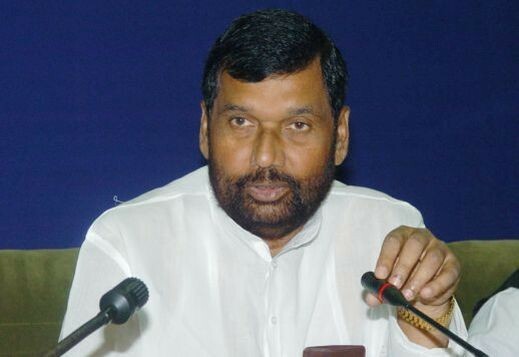 Shri Ram Vilas Paswan said that farmers’ interest and welfare is very high priority for the Government, this is the reason the Government is making sustained efforts to facilitate payment of sugarcane arrears. Due to these efforts arrears came down from Rs. 21,000 cr as to 2,700 cr as on 12.1.2016 for the sugar season of 2014-15. At the end of one year after National Food Security Act, 2013 (NFSA) came into force, i.e, upto July, 2014, implementation of the Act had started in 11 States/UTs. Since then, 14 more States/UTs have joined NFSA and the total number of States/UTs now implementing the Act is 25. By April it is likely to be implemented in all remaining States /UTs. In order to check leakage and diversions and to facilitate Direct Cash Transfer of food subsidy to the beneficiaries, Government has notified “Cash Transfer of Food Subsidy Rules, 2015” on 21.08.2015 under the NFSA. These rules provide that DBT scheme will be implemented in a State/UT with the consent of the concerned State Government/UT Administration. Under the scheme, in lieu of foodgrains subsidy component will be credited directly into the bank accounts of beneficiaries who will be free to buy foodgrains from anywhere in the market.The scheme has been launched in Chandigarh and Puducherry in September, 2015. Dadra and Nagar Haveli, is also in full readiness for implementation of this pilot cash transfer/ DBT scheme. To ensure that beneficiaries of the National Food Security Act get entitled foodgrains positively, rules for payment of food security allowance to the beneficiary in the case of non-delivery of foodgrains notified in January, 2015. In order to provide nutritional security to the economically vulnerable sections of society and to have better targeting of “other welfare schemes’ for poor, a Committee of Ministers set up under the chairmanship of Minister for Consumer Affairs, Food and Public Distribution not only decided continuation of foodgrain allocation for Other Welfare Schemes but also recommended for providing milk and eggs – pulses etc. under the schemes. Out of 24 crore 99 lakh 95 thousand 458 cards in the country, 24 crore 17 lakh 32 thousand 202 cards have been digitised, which shows 97 % achievement, soon it will be 100%. Online allocation of foodgrains implemented in19 states/UTs. 61,904 FPS automated by installing ‘Point of Sale’device. By March this year about 2 lakh FPS will have this device. Toll free help lines installed in 32 States/UTs. In order to give relief to the farmers affected by the unprecedented rains & hailstorms this year, Government relaxed Quality norms for the wheat procurement. The Central Government also decided to reimburse amount of value cut on such relaxation to the State Government so that farmers get full Minimum Support Price (MSP) even for shrivelled and broken wheat grains or grains having lustre loss. Such a farmer’s centric step has been taken for the first time by any Central Government.Government agencies procured 280.88 lakh MT wheat during RMS 2015-16, providing a saviour for the farmers affected by rains and hailstorms. In a bid to increase reach of minimum support price (MSP) operations to more farmers and increase procurement of paddy, the procurement policy has been modified and private firms have been allowed to procure paddy from farmers in a cluster, identified by the respective state government in the states of Assam, Bihar, Eastern Uttar Pradesh, Jharkhand and West Bengal. These states lack necessary infrastructure and experience in large scale procurement operations and the Food Corporation of India (FCI), too, does not have a robust procurement mechanism which often forces farmers to go for distress sale. Private firms would deliver custom milled rice (CMR) at the FCI or state government-owned agency godowns. There is huge increase in procurement of paddy in the current Kharif Marketing Season (KMS), which begun on 1st October, 2015. The total quantity of paddy procured in terms of rice till date is 224.80 lakh MT, which was only 174.04 lakh MT till this date during the previous KMS. For creation of 1.5 LMT Buffer Stock of Pulses, FCI started procurement pulses from farmers at market price or MSP whichever is higher. FCI has targeted the procurement of 20,000 MT of Arhar, 2,500 MT of Urad (Total 22,500 MT) during Kharif Marketing Season 2015-16. Similarly, target has been fixed for procurement of 40,000 MT Chana and 10,000 MT of Masur (Total 50,000 MT) during Rabi Marketing Season 2015-16. The drop in international prices of imported oils was affecting the prices of domestically produced edible oils consequent upon which farmers’ interests were affected. Department of Food and Public Distribution had recommended an increase in the import duty. Accordingly, the import duty on Crude oils has been increased from existing 7.5% to 12.5% and the import duty on refined oils from existing 15% to 20%. on 17.09.2015. To bring all operations of FCI Godowns online and to check reported leakage, “Depot Online” system initiated in 30 sensitive depots. Depot Online System will be rolled out in all the FCI-Owned Depots by May this year and in all other hired depots by year end. The FCI has been asked to take up construction modern silos for storage of total 100 lakhMT capacity at different locations in the country under PPP mode which will help in maintaining the quality of foodgrains, minimize losses and ensure rapid bulk movement of foodgrains. The Government of India approved sale of wheat and rice available in central pool above the stocking norms in the beginning the quarter of 2015-16 under Open Market Sale Scheme (OMSS), 44.81 lakh MT of wheat and 0.73 lakh MT of Grade-A rice has been sold up to 2ndJanuary 2016. Despite 2014 and 2015 having been monsoon deficit years, due to robust procurement arrangement made by FCI, there is more than adequate foodgrain stock available with the Government under Central Pool. As on 1st January, 2016, there is 237.88 lakh MT of issuable wheat stock under Central Pool. The FCI is also stepping up Open Market Sale of wheat at reasonable rates to check inflation and also to provide supplies to the private flour mills and trade. Similarly, on 1st January, 2016 there is a stock of 126.89 lakh MT of rice under Central Pool, which is 50.79 lakh MT more than stocking norms. This excess quantity of rice will help in meeting any contingencies arising due to monsoon deficit or natural calamities in near future. Adequate supply of foodgrains made using multi-modal transport in North Eastern States despite disruption in rail route due to gauge conversion from Lumding to Badarpur.80,000MT foodgrains moved through roads every month besides creating additional storage of 20,000 MT in the region. Foodgrains also inducted into Tripura via riverine route passing through Bangladesh. Government revised the buffer norms in January, 2015 for better management of foodgrain storage. During 2015-16 both storage and transit losses have been reduced to (-) 0.03% due to storage gain in wheat and 0.39% against MoU target of 0.15% and 0.42% respectively. Storage capacity for central pool stocks of food grains increased to 796.08 lakh MT. New godowns having capacity of 10 lakh MT under Private Entrepreneur Guarantee Scheme (PEG) constructed in 20 States. Besides this storage capacity of 62,650 MT in North Eastunder Plan Scheme and 1.78 lakh MT in 12 States added through CWC. 610.50 lakh MT of foodgrains were allocated to States/UTs for distribution under TPDS and other Welfare Schemes during 2015-16 (upto 18.01.2016). The Central Warehousing Corporation (CWC) also achieved all time high turnover of Rs. 1562 crore in 2014-15. The Government took several measures to facilitate payment of cane price arrears by infusing liquidity into the sector. A scheme for extending soft loans to the extent of Rs. 6000 crore to the sugar industry was notified on 23.6.2015. Rs 4152crore have been disbursed under the scheme. The government also extended period by one year for achieving eligibility under the soft loan scheme and decided to bear the interest subvention cost to the extent of Rs. 600 crore for the extended period. Direct Subsidy to farmers, Government decided to pay a production linked subsidy of Rs 4.50 per quintal cane in 2015-16 season, to sugar mills to offset the cost of cane and facilitate timely payment of cane price dues of farmers for sugar season 2015-16. A notification in this regard issued on 2.12.2015. Funds released under the scheme shall be directly credited into farmers’ accounts. Remunerative prices for Ethanol supplied for blending have been substantially increased and excise duty on ethanol supplied for blending in the next sugar season has been waived. As a result, the supplies of ethanol for blending have increased from about 32 crore liters per year to 83 crore liters per annum. It is also noteworthy that the sugar industry is now active in the Ethanol Blending Program, by supplying 6.82 cr ltrs of ethanol to Oil Marketing Companies during the current sugar season (since October, 2015) as against mere 1.92 cr ltrs supplied during the corresponding period in the last season. Furthermore, the contracted quantity under EBP is at an unprecedented 120 cr ltrs in the current season which a historic high. As a result of these sustained efforts, the cane price arrears which were Rs. 21,000 crore in peak in April 2015 in sugar season of 2014-15 have came down to Rs. 2,700 crore as on 12.1.2016. In order to ensure quality of products and services for common consumer, the Government introduced Bureau of Indian Standards Bill, 2015 in Parliament to replace 29 years- old BIS Act. The new Bill has been approved by the Lok Sabha. In the new Bill provisions have been made for simpler self-certification mechanism, mandatory hallmarking, and product recall and product liability for better compliance to standards. To improve “ ease of doing business”, simplified conformity assessment schemes, including self- certification and market surveillance instead of inspectors visiting factories introduced, thereby ending the inspector raj on standards. Consumer Protection Bill 2015 that seeks to simplify and strengthen consumer grievance redressal procedure introduced in the Parliament this year. Setting up of a Central Protection Authority which will have powers to recall products and initiate class suit against defaulting companies, including e-retailers proposed. E-filing and time bound admission of complaints in consumer courts is another important provision made in the Bill. It would be launched on the World Consumer rights day on March 15 this year. Joint campaign organised with Heath, Financial Services and other departments for greater consumer awareness. During the year the Department of Consumer Affairs intensified its multimedia campaign under the banner of Jago Grahak Jago, with special emphasis on rural area. To tackle the menace of misleading advertisement, a dedicated portal www.gama.gov launched. It enables consumers to register their grievances against misleading advertisements in six key sectors viz. food and agriculture, heath, education, real estate, transport and financial services. The complaints lodged are taken up with the relevant authorities or the sector regulators and the consumer is informed after the action taken. To provide a host of consumer services under one roof, GrahakSuvidhaKendras launched in six locations: Ahmadabad, Bangalore, Jaipur, Kolkata, Patna and Delhi on March 18, 2015. Such centres will be set up in every State in a phased manner. They will provide guidance to consumers regarding consumer laws, rights of the consumers, procedure of approaching Consumer Courts and various other consumer related issues including quality assurance and safety of products. Advance action plan drawn to ensure availability of Essential Commodities and weekly monitoring meeting of an inter-ministerial committee chaired by the Secretary Consumer Affairs. Decision taken to procure 1.50 lakh MT of pulses for creating buffer stock. Decision to import of 10,000 MT pulses already taken. MSP increased for kharif pulse by Rs 275 per qtl for Tur&Urad, and by Rs 250 per qtl for Moong. Ban on export of all pulses, except Kabuli Chana; and Organic Pulses & lentils up to 10,000 MTs. Zero import duty on pulses extended upto Sept,2016. Zero import duty extended till 30th September 2016. States/UTs empowered to impose stock limits, on Onions and Pulses to check hoarding and black marketing under EC Act, 1955.